Organizations that go the extra mile to ensure their networks are properly managed and secured don’t just benefit from peace of mind. A new survey from network control specialists Infoblox shows that maintaining high levels of network security directly correlates with positive business outcomes. 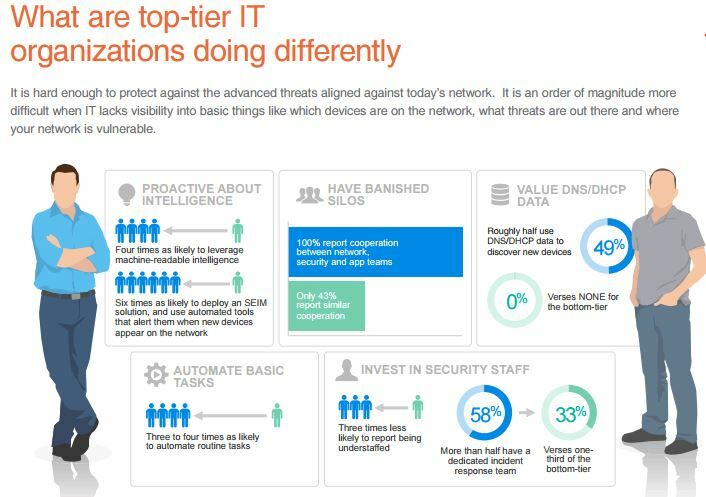 The company surveyed 200 enterprises in the U.S. and Canada for its 2016 Network Protection Survey, which revealed major differences in business outcomes based on how well organizations secure and manage their networks. The company queried businesses on their practices regarding security, operations and visibility and used the answers to rank the organizations. Rankings ranged from those adhering to best practices, defined as top-tier, down to those who deviated farthest from those practices, or bottom-tier. Infoblox found that top-tier organizations were differentiated by achieving positive business outcomes based on maintaining a strategic approach to IT as a key business enabler. These companies were defined as more agile and strategic than their counterparts, able to provision new users, devices, applications and servers more quickly than bottom-tier companies. The result was greater levels of internal customer satisfaction with IT departments, stronger company-wide security, smoother running networks and better visibility into and control over infrastructure details. In terms of cyber security, the survey found that top-tier companies were more committed to network protection than their counterparts. As the graphic below from the report illustrates, these companies generally automate basic network tasks to focus on more strategic areas. They also report cooperation among network, security and application teams, an integral component of making IT part of their strategic business objectives. Other common practices among these organizations include mining DNS and DHCP data for security along with investment in technologies like machine-readable threat intelligence and SIEM solutions. “Innovative technology such as network automation and context-aware security can make a big difference in helping IT organizations meet their key business objectives in customer experience, risk management, operational efficiency, and visibility,” said Ashish Gupta, chief marketing officer at Infoblox.